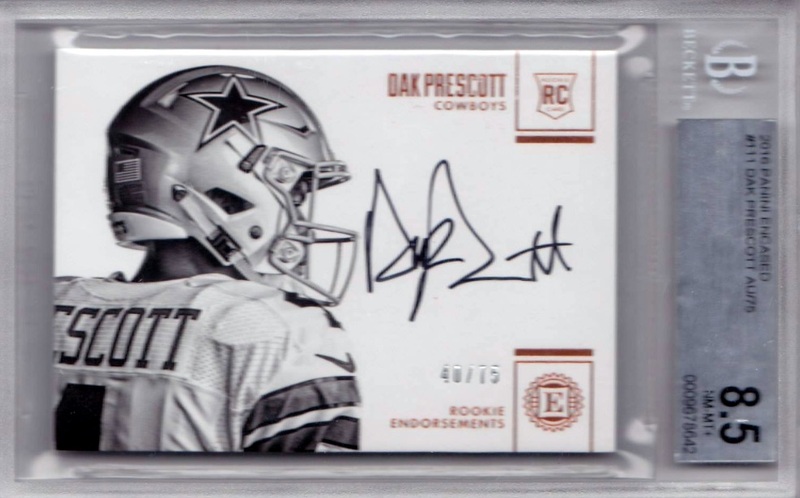 Debuting in the hobby, 2016 Panini Encased Football gets its name from the slabbed and graded autograph found in every box. A total of four hits fall in each hobby box and all on-card autographs are limited to 99 copies or less. 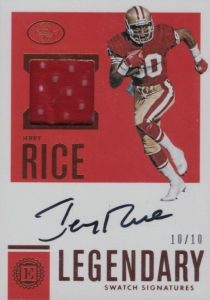 Featuring only hard-signed options, the graded card in each box of 2016 Panini Encased Football comes from the Rookie Dual Swatch Signatures, Rookie Endorsements, Rookie Notable Signatures, Rookie Cap Patch Autographs or Scripted Signatures sets. 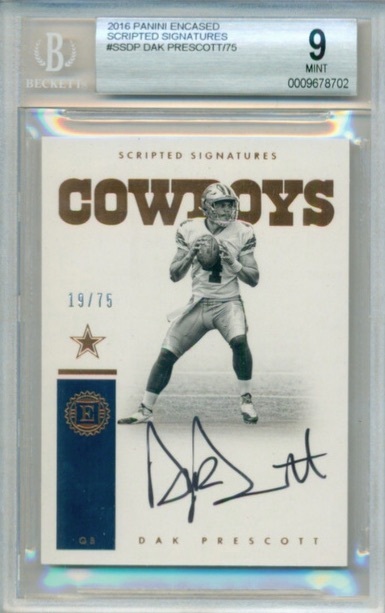 Other signed cards in 2016 Panini Encased Football concentrate on the current and former stars and also showcase on-card signatures. They include Legendary Swatch Signatures and Vaulted Veteran Material Signatures. 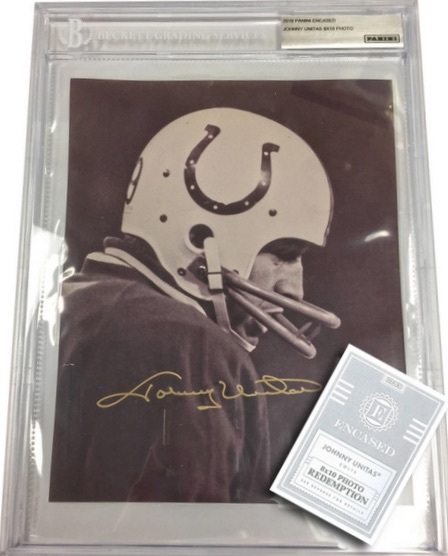 Cut Signature redemptions focus on the all-time greats with a jumbo format. 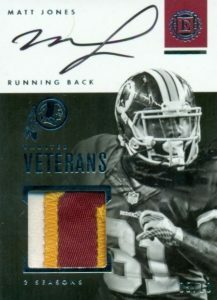 Lastly, the premium inserts are rounded out by memorabilia cards that fall two per box of 2016 Panini Encased Football. 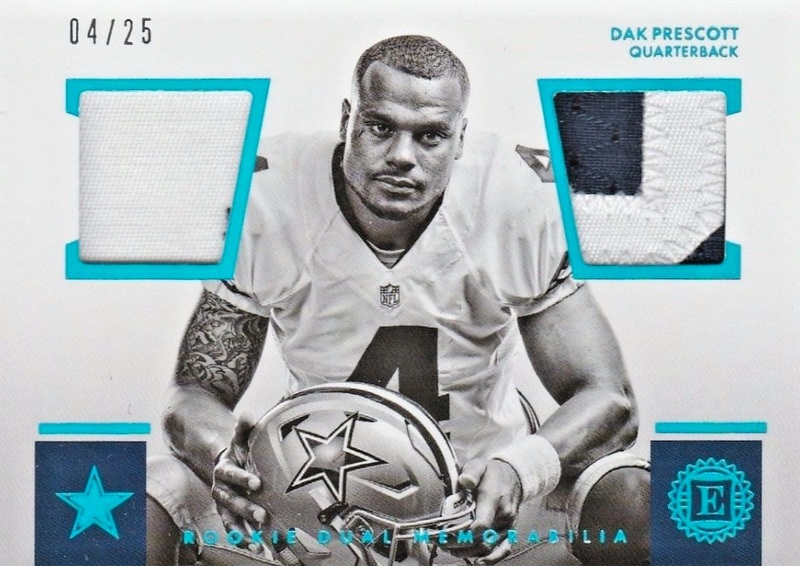 Among these choices are sets for Substantial Swatches, Pro Bowl Jumbo Materials, Pro Bowl Dual Materials and Rookie Quad Memorabilia. 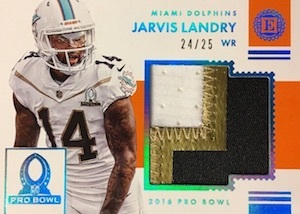 Various limited parallels apply to the cards in 2016 Panini Encased Football, including Gold, Platinum, Sapphire and Silver. 2016 Panini Encased Jordan Howard Rookie BGS 8.5 Auto10 On Card Auto ONLY 50 75! 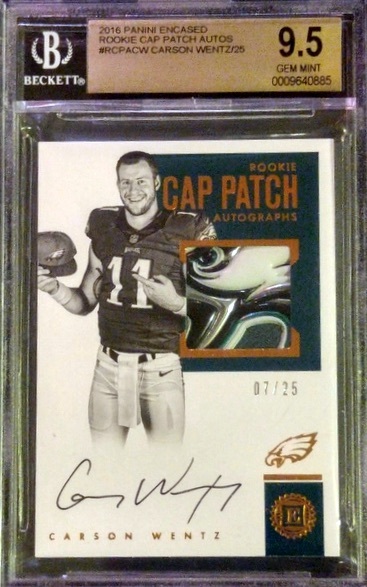 Shop available 2016 Panini Encased Football cards on eBay. PARALLEL CARDS: Silver #/10, Gold #/5, Platinum 1/1. 7 subjects. Includes various signed items such as photos, index cards, and postcards. 14 cards. Serial numbered #/10. Shop on eBay. 7 cards. Serial numbered #/5. PARALLEL CARDS: Silver #/10 (No Derek Carr)*, Gold #/5 (No Derek Carr)*, Platinum 1/1. 25 cards. Serial numbered #/49. Shop on eBay. PARALLEL CARDS: Sapphire #/25, Silver #/10, Gold #/5, Platinum 1/1. PARALLEL CARDS: Silver #/10*, Gold #/5*, Platinum 1/1. Not all subjects found in Silver/Gold parallels. See the full spreadsheet for specific info. 30 cards. Serial numbered #/49. Shop on eBay. 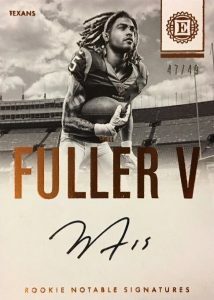 PARALLEL CARDS: Silver #/10, Gold #/5, Platinum 1/1 (No Corey Coleman)*. 31 cards. Shop on eBay. 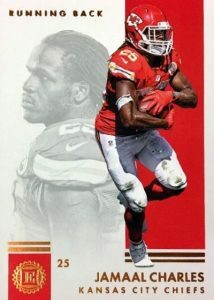 PARALLEL CARDS: Gold #/5*, Platinum 1/1. 19 cards. Serial numbered #/15. 39 cards. Serial numbered #/49. Shop on eBay. Not all subjects found in Silver/Gold parallels. * See the full spreadsheet for specific info. price is pretty high, if you don’t hit. with 9.5 and 10 auto on first box got kevin Hogan 1 of 1 with 8.5 on second box so I quit. looking at checklist its about a 50/50 chance that you get something that might salvage the box. but price is steep. I cant imagine even trying to build a set of common cards at this price point. the best product of this year!i hit a peyton manning sig swatch and paxton lynch dual swatch graded.very nice looking cards. I have participated in every brand release for the 2016 season and this is my favorite. To get rookie cards Beckett graded 9/10 is a dream come true for me. The designs are classy, clean and professional, not full of skittles rainbow colors and shiny prizms. These cards go straight into my personal collection safe, where they will wait for my kids to reap the benefits years from now. The ungraded cards are nice too. The entire set says quality and class. In my opinion.